You can call us on 1300 273 435 and talk to our friendly team if you have questions about our early intervention and how we can support your child and your family. Here, we also answer some of the commonly asked questions parents and carers often have. Why is AEIOU’s early intervention service centre-based? The goal of a centre-based service is to offer families good value for money, along with convenience and support while raising a young child with additional needs. Within a centre, your family can access support from a team of therapists and educators in one location, with a team that specialises in autism-specific early intervention. The environment is consistent, safe and nurturing. Our service is play-based, where children are children first. You can be confident in the naturalistic environment at AEIOU, where children are supported to develop play-skills, and the ability to develop friendships. AEIOU’s long day care licencing means both parents or carers can access the workforce, with children cared outside of intensive program hours for by highly skilled staff who know and understand your child’s individual needs and strengths. In addition to this, a full-time placement can also provide your family with some respite, ensuring you have quality time with other children or family members in your care. At AEIOU, parents and carers can also access regular workshops and advice relating to your specific, individual needs. AEIOU’s specialised group early childhood intervention is individually tailored to each child’s needs and is delivered by a transdisciplinary team. This team, comprised of multiple professionals shares responsibility by planning, developing and implementing supports for children and families. Simply, transdisciplinary means a team of people who are capable of not only working within their own profession, but who have the skill to work across other professions. For example, at AEIOU, our learning facilitators are able to implement various therapies for children within the scope of our program and the support of our therapy team. At AEIOU, transdisciplinary teams are made up of speech and language pathologists, occupational therapists, behaviour analysts and therapists, educators, learning facilitators and researchers. Will my child receive one-on-one time with therapists? AEIOU delivers a specialised group early childhood intervention for children aged 2-6 years. While most therapy is group based, there are times when individual children benefit from one-to-one teaching with their therapy and education team. How a child receives support AEIOU is dependent on their individual needs. AEIOU will assess your child through our specialised AEIOU curriculum and a range of standardised assessments. From this, an individualised plan (in conjunction with your family’s own priorities) is created. AEIOU’s one-to-one format brings children together in small groups, with a staff member rotating between the children, providing one-to-one teaching. Ultimately, we are working towards the children learning in a group as it is necessary for school. What if my child needs more OT than Speech or vice versa? How will you be able to ensure the correct amount of therapy is given to them? Each child’s early intervention plan has input from all therapists to ensure best outcomes. All staff are trained to implement each child's individual plan, collect data and analyse progress. A team of senior therapists (called Program Coordinators) provide guidance and support to all transdisciplinary team. What therapists are working with the children and how often? Behaviour Therapists, Occupational Therapists and Speech Pathologists make up a transdisciplinary team. Our model is for the transdisciplinary team to design each child’s individualised plan incorporating each therapist’s area of expertise. This ensures all staff are able to effectively implement each child’s therapy and care. 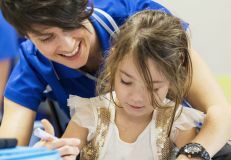 Currently, Speech Pathologists and Occupational Therapists spend half their time (4 hrs each day) on the floor with the children and training staff. The remainder of their time is spent creating strategies, meeting parents, creating and monitoring children’s programs, and administration. How do you implement individual plans if you’re working in small groups of two and three children? Each child’s goals are targeted across the entire day not just during learning centres (when the children are in small groups). All staff ensure that each child has enough learning opportunities across the day to achieve their goals. Data is collected for each child and analysed to ensure appropriate progress is being made. In a small group each child can be working on a completely different goal, dependent on their needs. If a group of children have goals with similar resources these are grouped together in terms of logistics but the children are still taught skills one-to-one. How long do children need to stay at AEIOU? There is no specified length of time that children need to stay, however, on average children are enrolled for 2 years. During their time at AEIOU, we consistently collect and analyse data which is used to inform each child’s individual plan and ensures we are delivering a quality service for each child. This information helps us determine when each child is ready for transition. This decision making process has a high level of parent input. How long before I will see changes in speech? One are strong priorities at AEIOU is to ensure every child develops a functional communication system. The most effective communications system is determined through a range of assessments and could be PECS, sign, vocal etc. Initially, we want to give the child a means to have their needs met and this may not be through vocal communication. Even if a child isn’t using vocal communication as their primary means of communication, we will continue working on vocals. We have a whole domain in the curriculum focusing solely on teaching vocal communication. How does AEIOU Foundation assist with toilet training and how long does it take? AEIOU staff are highly trained in this area and our toileting program has a high success rate. The time that toilet training take varies from child to child and is dependent on many variables. Each child will have an individualised plan devised to ensure toilet training success. Parents are supported throughout this process as it is vitally important that we work very closely to ensure success in the centre and at home. It would be really helpful if there was some information available on how to assist families when a child is having a meltdown. How can AEIOU help while we are on the waiting list? Understanding why a child is having a meltdown, or even biting and kicking, is difficult and is always individualised. We do have some information in our parent resource library, and there are also parent training sessions waitlist families are welcome to attend. It is our goal to ensure AEIOU’s service is accessible to all families, and offers excellent value for money. While some rebates are means tested (noting, NDIS funded packages are not), most families have out of pocket expenses that are equal or less to long day-care fees..
AEIOU is a profit for purspose organisation, and fees charged cover the therapy and teaching team we employ, and the operations of the business. What are the immunisation requirements? The No Jab No Pay Bill 2015 was passed through both Houses of Parliament on 23 November 2015. 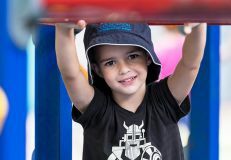 This Bill introduces changes to the immunisation requirements for families who receive Child Care Benefit, the Child Care Rebate and the FTB Part 1 end of year supplement. From 1 January 2016, parents will need to ensure their child's immunisations are up-to-date to continue receiving child care payments. Exemptions will apply for children who have a natural immunity or allergies to specific medicines if diagnosed by a general practitioner. For more information, refer to this fact sheet provided by the Australian Government Department of Education and Training. What changes are there with the DSM 5? The DSM 5 has been updated in an attempt to better characterise the symptoms and behaviours of groups of people who are currently seeking clinical help, but whose symptoms are not well defined by the DSM 4 (American Pyschiatric Association). The primary difference is instead of a 'triad' of impairments, a person with autism is now diagnosed based on a 'dyad' of impairments, which include social and communication, and thought flexibility. For more information about the changes, and how the decisions were made, click here. Further, for more details on the changes, go to www.psychiatry.org/DSM5. There is no single known cause for autism. Autism is a complex disorder and affects each individual differently. Genetics are thought to have some impact on autism, but autism may also occur spontaneously, or due to other causes. What we do know, is that vaccinations do not cause autism, and early intervention (via a program based on evidence-based practices) can make a significant difference to a child's ability to develop vital skills and reach their maximum potential. The implementation of the National Disability Insurance Scheme will change how families receive an autism diagnosis for their child. However, in most Australian states you can have your child assessed by a paediatrician. To do this, you will need a referral from your general practitioner and if you do receive a diagnosis, you will need to contact your local Autism Advisor. To access Helping Children with Autism funding, your Autism Advisor and AEIOU's early intervention service, your child must be aged under six. What’s it like to have autism? Reality to a person with autism can be a confusing mix of events, people, places, sounds and sights. There seem to be no clear boundaries, order or meaning. Social interaction and communication are fundamental components of our daily lives and influence our ability to connect with people, and function in society. Imagine if you suddenly woke up in a foreign country, and you could not speak the language. Then imagine you had no way of effectively communicating with the people around you. Furthermore, imagine how it would be if the people around you had a different set of social rules, for example, the way they greet each other and you were unable to understand what they were doing. Autism is not a physical disability. People with an autism spectrum disorder look just like everyone else. Because there are no obvious physical attributes that exist, it can be difficult for children or people affected by the condition, and to promote an understanding of autism. It's important to remember that when a child or person with autism experiences challenging behaviours, it is not a choice, rather it is a reaction based on their inability to communicate their needs, fears, or desires. At AEIOU we support children by teaching them vital skills, inlcuding the ability to communicate, helping to ease any frustrations. No, there is no cure for autism. However, while it is a lifelong condition, early intervention can make a big difference to a child's life. Many children can develop the ability to communicate, and learn self-help skills, develop academic skills, and improve fine and gross motor skills. At AEIOU Foundation, studies have shown children who complete the program experience a reduction in autism symptoms. About 70% of children transition to mainstream school. Each child develops new skills and AEIOU supports every individual, moderating the program with a plan that is based on their unique needs and strengths. Emily Perl Kinglsey wrote a poem about autism, which many parents at AEIOU Foundation feel they can relate to.